Today I am blessed to have an extremely personal post by good friend and thealogian K. A. Her bravery and strength in sharing her story so that others may not feel so alone is inspiring. I am so lucky to be able to consider this woman a friend. Remember, people in all walks of life have had abortions, and each one must deal with it in her own way. And each one needs support. My name is Kate. I'm a woman of deep, life-long faith. And a number of years ago, I aborted a wanted baby. I was in relationship with a man I loved deeply, but our relationship was not known to others. If our pregnancy had been discovered, we (or, at least, I) perceived that we would lose support as a family from all those who then supported us as individuals, and we wouldn't be able to make a life together, much less support our child. The decision was ultimately mine. He was there when I took the pill. A couple of weeks later, our relationship ended. In the midst of grieving the loss of that relationship, I lost sight of my grief for the tiny fetus that would have become our first-born child. Now, all these years later, I am the mother of two amazing daughters; I am also the wife of the best man I know. My life is beautiful and full. And I'm finally giving myself permission to grieve my first pregnancy, the pregnancy that became my first abortion. To my surprise and consternation, I've had a difficult time figuring out how to grieve it. Once I decided to allow myself to grieve, I intentionally tried to access my grief for over a day. Nothing came. I read a book called A Solitary Sorrow in which a therapist discussed her encounters with women who had had abortions. As I read the therapist's stories and considered my own, thousands of thoughts flooded my mind, but I couldn't access any emotional content. I had already shared the story of my abortion with those closest to me long ago, so I decided to shared my story with several additional trusted friends. When one of them--the one from whom I most feared judgment--replied with compassion, my heart broke open. I ran to my husband and sobbed on his chest, a tidal wave of long-hidden grief bursting the dam in my heart. In the United States, abortion is often heatedly discussed, but actual abortions--the abortions chosen by women all around us--are almost never discussed. To have had an abortion is an enormous taboo, and that impacts the self-perceptions of those who have abortions. The woman who has an abortion will often either perceive herself as a terrible, hypocritical sinner, or she'll tell herself that she's not supposed to feel any attachment to the tissue that grew in her womb. I am pro-choice and completely support the right of all women to choose whether or not to continue a pregnancy for the reasons she holds close to her heart, but I now also have the profound and personal realization that women who choose abortion need to be supported in their right to grieve that choice. The decision to choose abortion is rarely a neutral matter, and often it isn't the most desired outcome of a pregnancy, but when it is chosen it is almost always perceived as the best possible choice among the choices that are available. That makes for a lot of messy feelings, all hidden behind the rage of society's abortion debates. I am one woman among many who has experienced abortion, and sharing the story of my abortion publicly here and now is terrifying. Even though I already experience deep support from some, I expect judgment and hatred from others. I expect to be disowned and cast out by at least some in my life who would otherwise keep me close. Beyond those I know personally, I expect strangers to point fingers, to call me a baby-killer and a whore and an evil woman, and even to threaten me for daring to speak up. As I seek to answer my vocation as a future minister, however, I feel compelled to risk all of this. As a woman who buried her grief for years and discovered, after sharing it, that she is still loved, I can no longer justify cloaking myself in timidity and fear while other women still bear the burden of their grief alone (many in far more oppressive circumstances than mine). If I had known even one woman like myself--a woman of faith who chose abortion and dared to share her tale later so that others might be able to face their own stories--I might have been able to grieve and begin to heal far sooner. I invite any woman who has had an abortion to consider letting her grief rise up and to share her story with someone she trusts. And for those women who can't think of anyone to tell, consider sharing it confidentially with someone who will listen to your story without judgment. If you are someone to whom one of these grieving women shares her story, I invite you to release all your expectations of how she should feel or how she should have acted and listen instead with all the tenderness and compassion you hold within you. As a Christian, I experience on this Easter day the strange, radical truth that tombs aren't necessarily destined to remain closed. 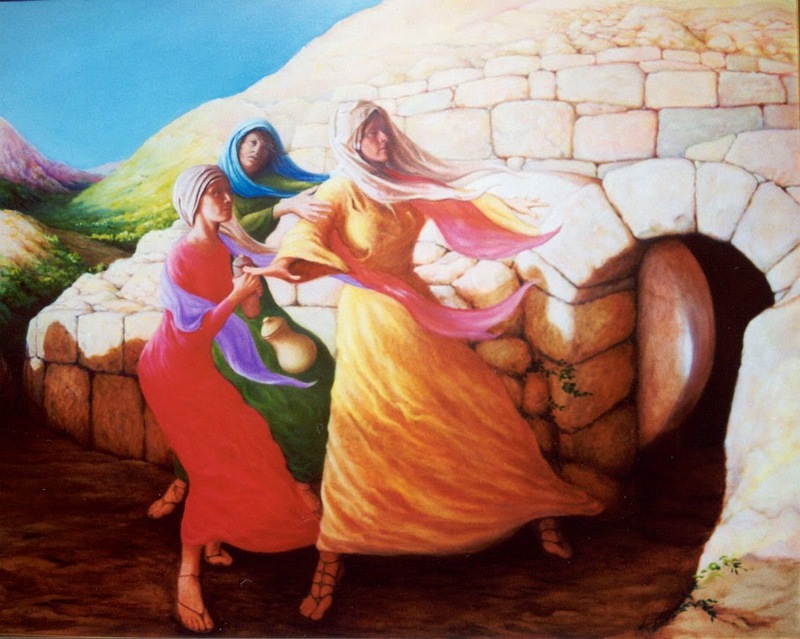 Perhaps, if we who have experienced abortion allow our grief to rise up, we will visit the tomb one day only to find it empty--and we'll realize that what was dead was made to be raised to new, undying life in us, just like Jesus was raised up from death in the midst of those who loved him. "...abortion is often heatedly discussed, but actual abortions--the abortions chosen by women all around us--are almost never discussed." is so very true, and it happens the world over. I wish you much support in your grief. I can't help but think that the conversation about abortion would radically change if actual abortions--of women we know--were discussed by those women openly. What a courageous, loving spirit you are. Thank you for opening the tomb and allowing your truth to rise up. I hope that your story will enable others to break open their silence in ways that are healing for them too. Thank you, Betsy. ♥ I hope it does, too.